Hillcrest’s parent company, Nikal, has appointed McGoff Construction to deliver enabling works on Altair in Altrincham with a start-on-site targeted for June 2019. 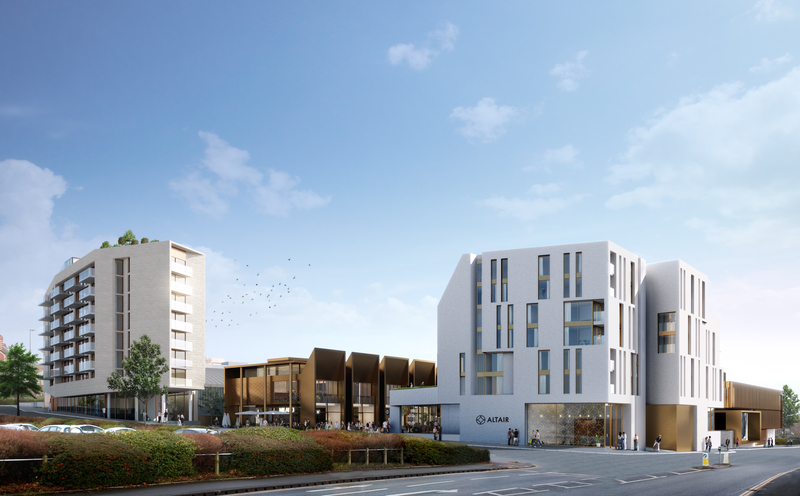 The multi-award winning construction business, which is based in Altrincham, is also in talks with Nikal to deliver all phases of the £70million development. The new residential and retail Quarter occupies a strategic 4.5 acre site at the junction between Moss Lane and Oakfield Road in Altrincham Town Centre. It is adjacent to Altrincham’s Transport Interchange and connects the established residential areas to the east of the town with the main high street. It was previously announced that the first building of 59 one and two bedroom luxury apartments plus ground floor retail would be delivered by Eric Wright Construction. However, long delays in receiving approvals for major infrastructure work, which involved liaising with Network Rail and other statutory bodies, led to Nikal having to renegotiate its construction contract with the Preston based firm. Regrettably, after a lengthy period of discussions, an agreement could not be reached and Nikal and Eric Wright chose to part company. Says Darren Jones, Development Director at Nikal, “Negotiating a new contract with a new contractor for a scheme of this scale and significance is not a quick and easy task. Thankfully, McGoff were known to us and have repeatedly demonstrated their considerable capabilities on a variety of successful projects. It’s also satisfying to be able to appoint a local Altrincham based business, with a track record in delivering housing, retail and leisure schemes, to what is an important development in their home town. Altair One, the first phase residential element within Altair, was brought to market by Hillcrest Homes in Summer 2017. Close to 60% of the apartments are currently reserved. McGoff Construction Ltd is a privately owned, multi award winning construction and integrated support services business based in Altrincham. An Investors in People Gold and Sunday Times Top 100 Small Business, McGoff Construction directly employs over 130 people and operates on a national basis for an impressive blue-chip client base. McGoff has an impressive project portfolio and is currently on site in Castlefield, Manchester, delivering a sold out £55M Manhattan-inspired residential apartment scheme called ‘Downtown Manchester’.